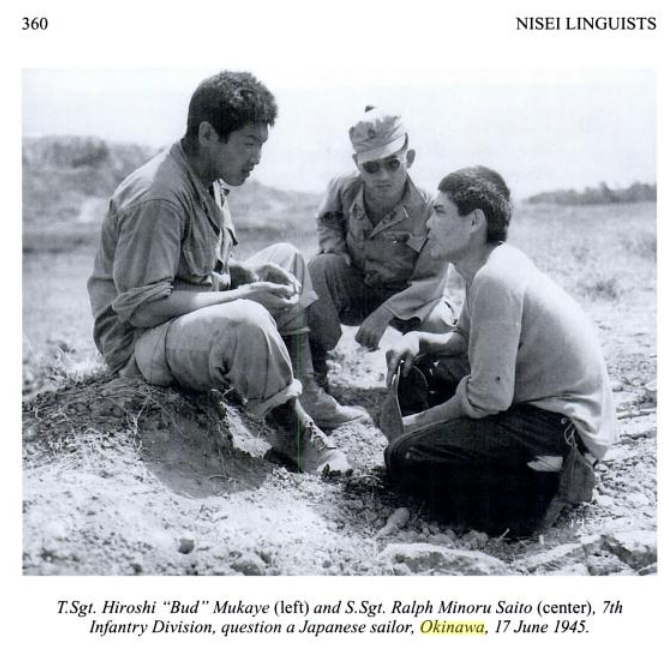 During the Battle of Okinawa, Nisei linguists in the MIS translated “Japanese Imperial Army documents and [interviewed] Japanese prisoners.” They also used Okinawan dialects to coax civilians out of caves. Many Okinawan-Americans were placed in relocation centers during the war, and some, under interrogation, refused to go to war against Japan. They were dubbed “no-no boys” and sent to Tule Lake. For further information re the nisei soldiers on Okinawa, see James C. McNaughton‘s Nisei Linguists: Japanese Americans in the Military Intelligence Service During World War II (U.S. Government Printing Office, 2006), pages 355-370. In this online preview, some of the pages are omitted, but enough remains to provide a reasonable background. Photo from Nisei Linguists, p. 360. A brief but fascinating paragraph (p. 368) in the book addresses the issue of “American citizens of Japanese ancestry who had remained in [Okinawa] during the war.” McNaughton reports that the numbers were “significant.” Ironically, they had been suspected by the Japanese government of being American spies. This subject interests me, personally, because my parents, who passed away a few years ago, were Kibei, born in the U.S. (Hawaii) but schooled, as children, in Okinawa. Fortunately, they returned to Hawaii before the war. My father’s schooling in Japan placed him on a list of dangerous aliens, and he was arrested after the Pearl Harbor attack. In early 1942, he, my mother, and my oldest sister were shipped off to a relocation center in Jerome, Arkansas. Later, when questioned about his willingness to go to war against Japan, he refused, and the family was sent to Tule Lake. The “no-no boys” weren’t alone in their reluctance to battle against the Japanese. In fact, many who joined U.S. forces shared the same feelings. For example, Pfc. Thomas Taro Higa, earlier in the war, had ignored the MIS recruitment efforts. He says, “I think that most of us did not respond to the recruitment because we felt a certain mental agony in engaging in interpreting activities against Japan, our grandfather’s country, even for the sake of assisting the country of our birth…. Many Nisei felt less mental agony in going to the European front and fighting against the Germans” (365). The Okinawan-Americans who were among the civilian population in the battle also interests me because one or two of my father’s sisters had also been born in Hawaii. The family returned to Okinawa after their contract was up. Years later, just before graduating from high school, my father used his American citizenship to return to Hawaii, but the rest of the family remained in Okinawa. I always wondered about their experiences, as American citizens, during and after the war.